Edmond E. De Mattia, 89, went home to be with Jesus on Thursday, October 11, 2018. Born in Steubenville Ohio in 1929; Edmond joined the United States Navy after graduating high school. Edmond was an Oboist for the United States Naval Band in Washington D.C. (1948-1968) earning the prestigious First Chair. 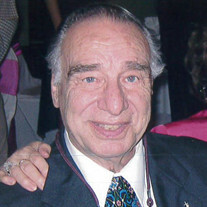 In addition to his time serving in the Navy, Edmond was the Founder and First Conductor (1973) of the National Concert Band of America in Washington D.C., Founder and 1st President (1978) of the Association of Concert Bands, Entrepreneur and faithfully devoted member of Clinton Christian Assembly of God in Clinton, MD. Edmond was the beloved husband of Elizabeth “Betty” (Rizzo) De Mattia. A loving Father to Victor De Mattia, Karen Anderson, Jeanine Reise, Edmond (Michelle) De Mattia, Andre (Rebecca) De Mattia, and Andrew (Angela) De Mattia. An affectionate Grandfather and Great Grandfather to many beautiful children; and cherished brother to Fedora De Mattia and Raymond De Mattia of Ohio. He was predeceased by his parents, Victor & Mary De Mattia, and his siblings Adriana, Lea, Hamlet. In lieu of flowers, the family is requesting donations to Clinton Christian Assembly of God (10506 Thrift Road, Clinton, MD 20735) towards the Building Fund as Edmond’s desire was to see the church expand. This entry was posted on October 21, 2018 at 7:35 pm and is filed under All News, Obituaries, z Obituary Ad Top. You can follow any responses to this entry through the RSS 2.0 feed.